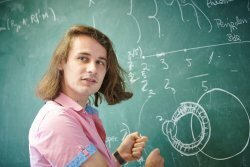 Peter Scholze is a new director at the Max Planck Institute for Mathematics. The 30-year old is one of the leading researchers in the field of Arithmetic Geometry. His achievements have already been recognized by a number of prizes and honors. Among others: a Clay Fellowship, the Prix Peccot of the Collège de France, the Clay Research Award, the Cole Prize for Algebra of the American Mathematical Society, the EMS Prize of the European Mathematical Society, the Leibniz Prize of the Deutsche Forschungsgemeinschaft, and the membership in four prestigious scientific academies. For now Peter Scholze's position at MPIM will be part-time in addition to his Hausdorff Chair at the Hausdorff Center for Mathematics of the University of Bonn.